The picture postcard village of Burton on the Wirral Peninsula stands on the estuary of the River Dee. The name means 'fortification farm or settlement', possibly in refence to the earthworks at Burton Point. Buildings of various styles and ages, from medieval times onward, line Burton's winding village main street. 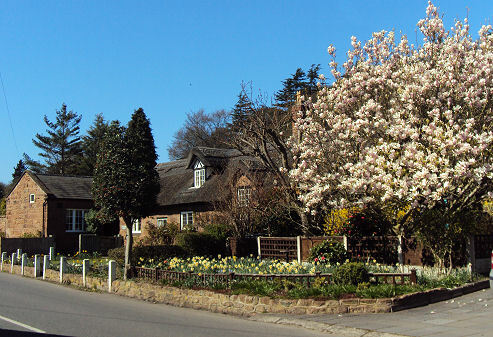 Quaint half-timbered and thatched cottages stand on a sandstone bedrock and mingle ecclectically with handsome Georgian brick houses. The village has a long history, having first been recorded in the Domesday Book of 1086 as 'Burtone'. It was a thriving port in medieval times but is now well inland as a result of the silting of the River Dee. 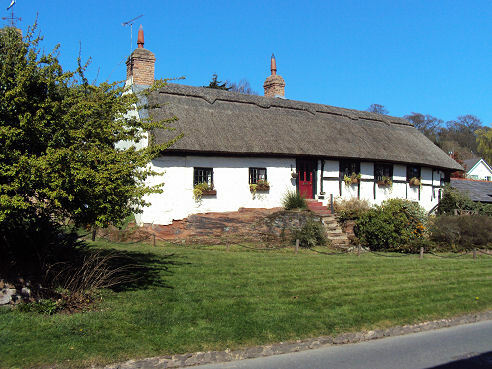 Barn End Cottage, a thatched single storey building on the village main street, dates from about 1450. At the lower end of the village stands Burton Manor, a brick manor house, which dates from the Edwardian period and was formerly the home of the Gladstones. 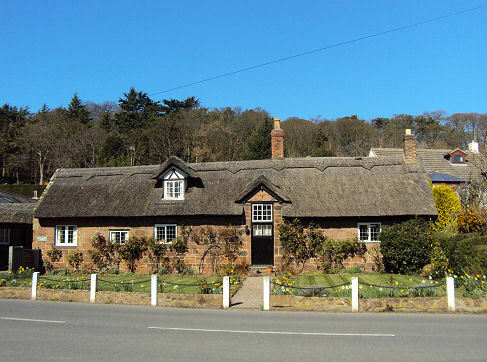 The sandstone and thatch cottage opposite Burton Manor was the birthplace of Thomas Wilson (1663-1755) , who later became Bishop of Sodor and Man. In 1724 he founded a free school in Burton for the children of the parish. 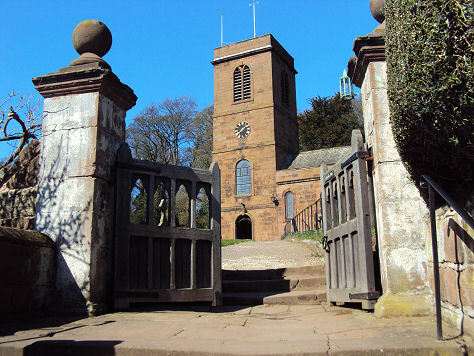 St Nicholas' Church at Burton dates back to 1721. A church has occupied the site since at least the time of the Domesday Book. Two Norman scalloped capitals which were discovered buried in the churchyard are now on display in the porch under the tower. A coffin lid dating from the thirteenth century, which is decorated with a foliated cross, is built into an internal wall in the tower.The Massey chapel survives from 1380. The chancel was rebuilt in 1870. One of the two Massey memorials is in the chapel is dated 1579, the other 1794. A glass topped case contains a volume of the "prayers, meditations, etc" of Bishop Wilson. A stone commemorating the Wilson family may be seen n the wall at the north end of the church. A footpath from the villlage leads to a wooded hill owned by the National Trust, and clothed with oak and beech, from which there are excellent views of the Dee Estuary. Nearby lie some of the most extensive marshlands in England which are alive with wildfowl and from which there are superb views of the Clwydian mountains of North Wales. Burton Mere Wetlands opened in the Autumn of 2011, is the RSPB's newest reserve. *Commencing at Gladstone Hall go right and proceed uphill to join the footpath at Vicarage Lane. Continue along the lane to arrive at Burton Mill Wood and pass through the gate by the National Trust Sign. *Take the path through woods to arrive at the ruins of old mill. Drop down to Neston Road and turn left then join the path on your right which leads to Station Road. Continue along Station Road to Hampston's Well. * Return to Neston Road and take the footpath leading to the woods passing behind School House. Continue past the Quakers Graves to descend into the Churchyard of St. Nicholas Church. * Continue down the path into the village. Ness Gardens Spectacular Ness Botanic Gardens on the Wirral peninsula cover 64 acres. The gardens occupy a pleasant position overlooking the Dee estuary. Brotherton Park, a nature reserve, is a one of the finest examples of ancient woodland on the Wirral and once formed part of the Royal forest of Wirral dating back to the end of the last ice age. Other habitats on the reserve include wildflower meadows, reed swamps and historic parkland. Brotherton Park and Dibbinsdale comprises of 47 hectares of semi-natural countryside along the valley of the River Dibbin. Eastham Country Park is situated on the banks of the River Mersey, the park covers a hundred acres and contains some of the finest mature trees to be found on the Wirral. The park offers excellent views across the estuary and the cliffs at provide superb sites for viewing the flocks of waders and ducks on the estuary. Much of the Estuary is now designated a Site of Special Scientific Interest. Wirral Country Park based around the Wirral Way, a footpath which traverses the track bed of the former railway route from West Kirby to Hooton for twelve miles (19km). The railway closed in 1962. The park is large and diverse enough to absorb a wide variety of activities, from walking, riding, cycling, running, birdwatching, picnicking and barbecues.